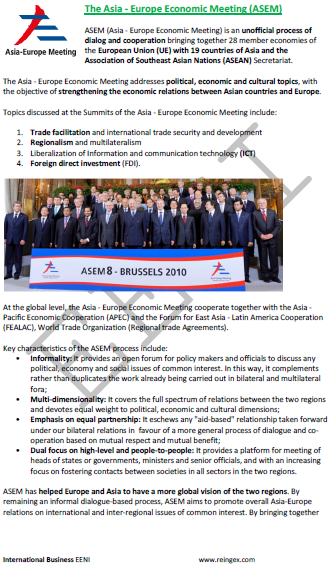 Syllabus of the Online Course (Subject): Asia-Europe Economic Meeting (ASEM). Description of the Online Course: Asia-Europe Economic Meeting (ASEM). 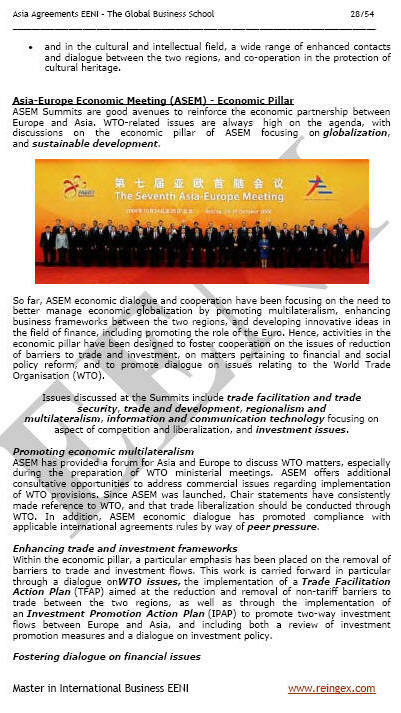 ASEM (Asia-Europe Economic Meeting) is an informal dialogue and cooperation process bringing together twenty-eight member economies of the European Union (UE) with nineteen Asian Countries and the Association of Southeast Asian Nations (ASEAN) Secretariat. The Asia-Europe Economic Meeting addresses political, economic, and cultural topics, with the objective of strengthening economic relations between Asian Countries and Europe. The Asia-Europe Economic Meeting Headquarters are in Singapore. At the global level, the Asia-Europe Economic Meeting cooperates with the Asia-Pacific Economic Cooperation (APEC), Forum for East Asia-Latin America Cooperation (FEALAC) and World Trade Organisation (Regional Trade Agreements). The only institution in the Asia-Europe Economic Meeting is the Asia-Europe Foundation, a global not-for-profit foundation, responsible for promoting cultural, intellectual and people-to-people contacts between Asian Countries end Europe. The Asia-Europe Economic Meeting (ASEM) members are Australia, Austria, ASEAN Secretariat, Belgium, Brunei Darussalam, Bulgaria, Cambodia, China, Cyprus, Croatia, Czech Republic, Denmark, Estonia, European Commission, Finland, France, Germany, Greece, Hungary, Indonesia, India, Ireland, Italy, Japan, Korea, Kazakhstan, Laos, Latvia, Lithuania, Luxembourg, Malaysia, Malta, Mongolia, Myanmar, Netherlands, New Zealand, Pakistan, The Philippines, Poland, Portugal, Romania, Russia, Singapore, Slovakia, Slovenia, Spain, Sweden, Thailand, The United Kingdom, Vietnam. The Asia-Europe Economic Meeting (ASEM) belongs to the economic spaces of Sinic-Buddhist Civilisation, Hindu Civilisation, Western Civilisation and Islamic Civilisation.